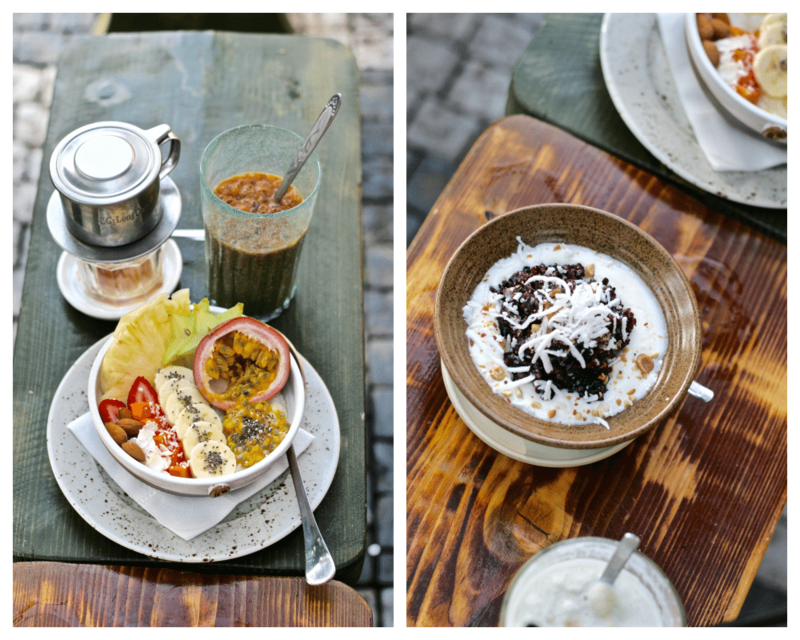 While visiting different cafes in Prague you could easily get the feeling they are all based on the same concept. 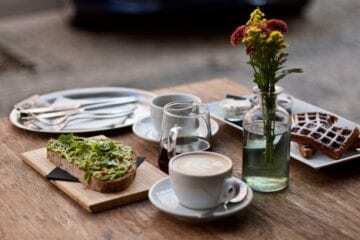 Coffee, pastry and brunch are included in a typical offer of the most speciality coffee shops in the capital. Even though I do love a great many of them, it is always nice to discover something different. For example the two Asian-inspired cafés I am going to introduce today! Momoichi is everything but an ordinary café. 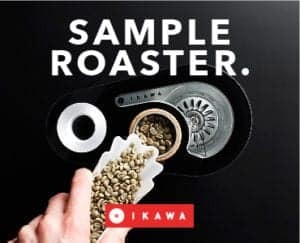 With its inspiration in Japanese culture, it represents a unique idea of combining speciality coffee with premium tea, as well as traditional Japanese cuisine with European food. It is a Coffeetearia. This complex idea creates a very balanced and distinct place. The cafe is based on flawless service, a neat interior and a top quality menu with a touch of Japan. Lukas Kubin, the owner of Momoichi (the name reflects the philosophy of peace and understanding connected with Momoyama period in Japan) has always dreamt of working in hospitality but the right time had not come until last year. He quit his stable marketing job and made his way right into running his own café. “As a graduate Japanologist, I always felt close to Asia. 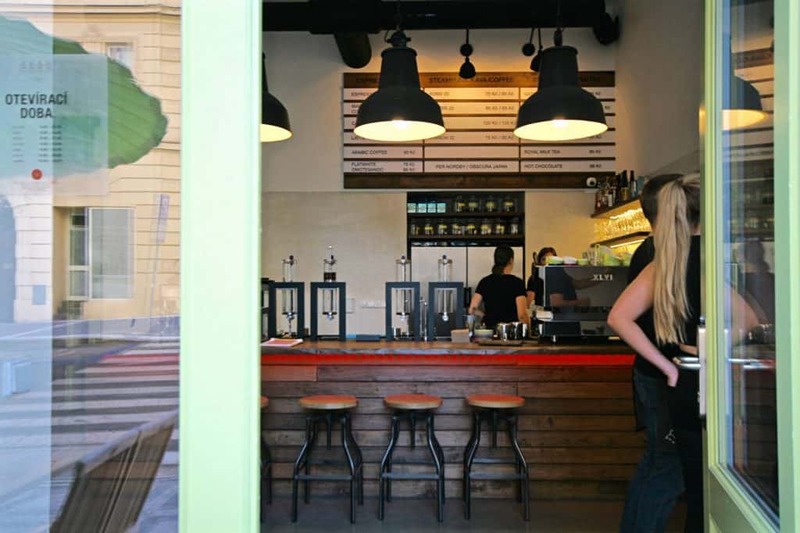 When I then thought about Prague coffee scene I realized there is a lot of very similar cafés resembling one another and I just wanted to create something different.” And that is exactly what he did. Let’s have a look at the menu then. 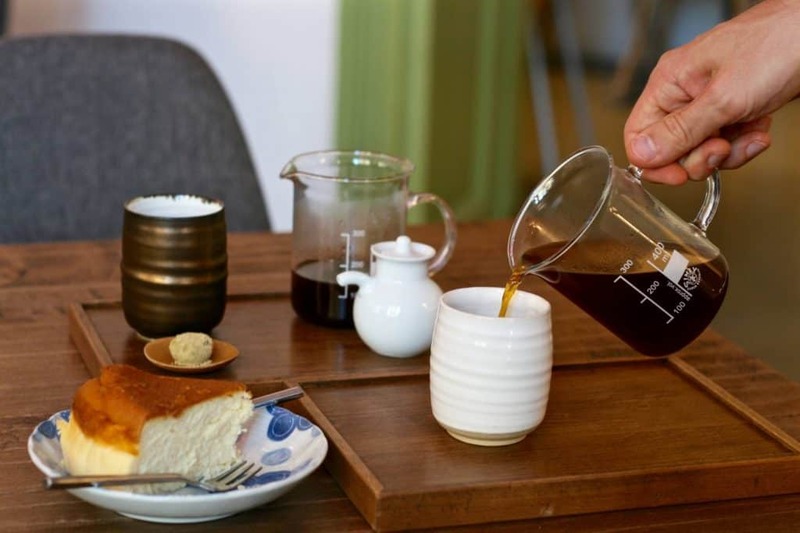 “I didn’t want to make any exceptions and for I am a coffee lover as well as a tea lover the idea was to offer them both the highest quality there is.” He thus serves a wide range of organic Japanese teas which you won’t find in any other café. 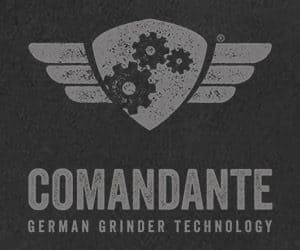 They are all prepared on an Alpha Dominche Steampunk brewing machine, which is a method based on a combination of steam and vacuum. They have two of them for tea and two of them for coffee. 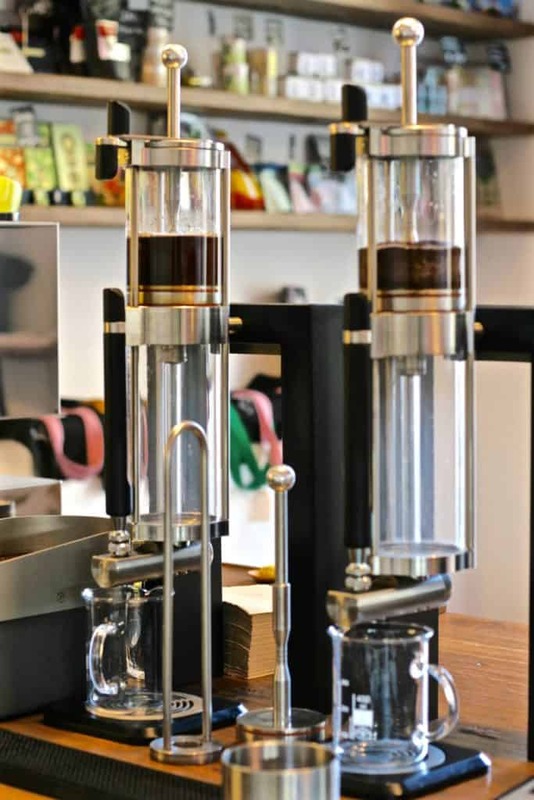 There are four different types of coffee brewed with Steampunk which you won’t be able to try elsewhere. We tried the most famous ones: Kono 20 and Nel 50. 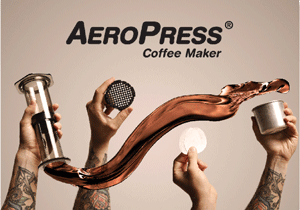 The first one was supposed to be similar to the V60 method, yet it had a more developed body. Made with a Washed Tanzanian coffee from the Czech roastery Rebelbean, it was sweet in the aftertaste and very fresh. Nel 50, on the other hand, was served with a dash of milk to reduce the heavy and bitter taste of this strong coffee. It was too much without the milk, however, it tasted balanced and sweet when combined. We also tried double espresso made with Faema E61 coffee machine from Fuglen Coffee Roasters in Tokyo. 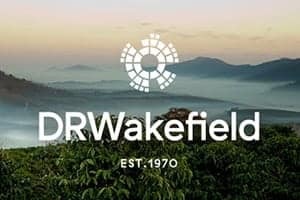 Natural processed Brazil was sour at first, developing into more floral and fruity taste which made almost sweet aftertaste. It would be a pity to skip the opportunity of eating here. The food menu is a combination of seasonal produce with traditional Japanese ingredients, it is always fresh and homemade. The signature dish you have to try is Okonomiyaki, a traditional Japanese omelette with cabbage, eggs, bacon, cheese and smoked Bonito flakes. It is nothing compared to an omelette as we know it! Tasty, and filling too! The second, very typical meal we tried was Sichuan Wonton & Wafu salad. It is a slightly spicy soup with traditional dumplings filled with minced pork, chilli sauce and chilli dressing. It is served with a large salad with a wafu dressing and it combines sweet, sour and spicy tastes. If you are still not full (as I doubt) you need to give at least one of the desserts a try. Japanese pastry chef in the house, they are all made with unusual ingredients such as sakura, green tea or matcha. We tried Japanese cheesecake which looked a bit like the traditional Czech sponge cake, but it was fluffier and so much lighter! 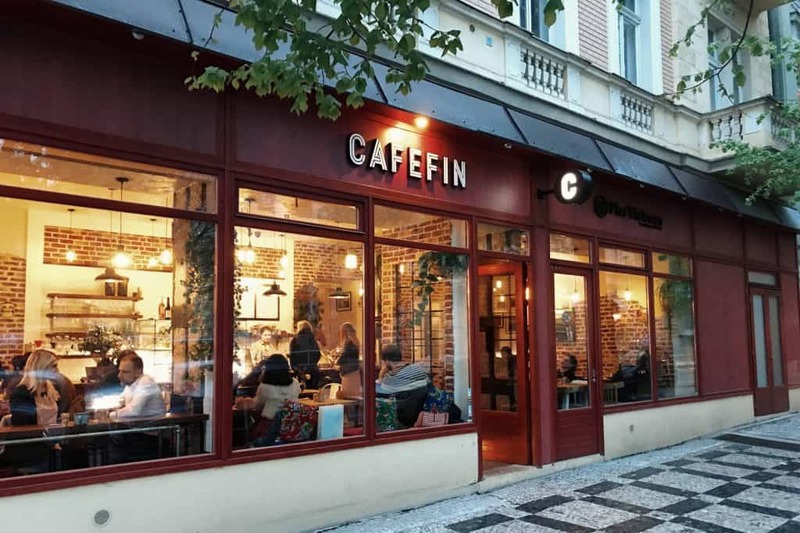 Just a little walk from Momoichi, you can find a Vietnam-oriented café called Cafefin. Inspired by Vietnam in the beverage as well as food offer it brings us some still unknown tastes of this Czech minority. Coming up to the cafe, the first thing you notice are large windows that make the facade hard to overlook. But it takes just a blink of an eye to focus on what is inside. Colourful and various furniture, exposed brick walls, flowers and art photographs. A combination which makes you wonder if you are looking at a designer store, a gallery or a café. 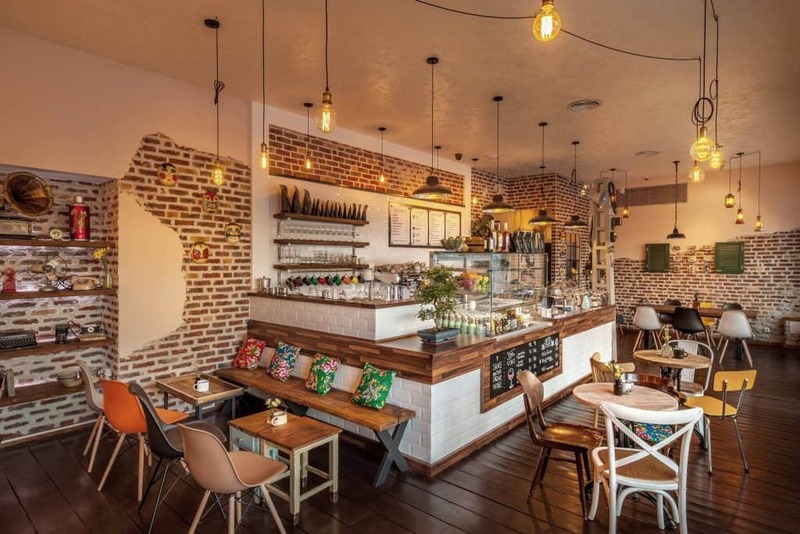 As Jackie Tran, the owner of Cafefin explains, the first idea he had was not of a café nor a restaurant. “I just wanted to find a space for my photographs to be exposed. When I was travelling around Iceland couple of years ago I made so many great pictures and it seemed to me that it would be a shame if I did not show them to people. Thus, I decided to create a gallery,” explains Jackie who originally is a designer, his first thoughts on the new business. 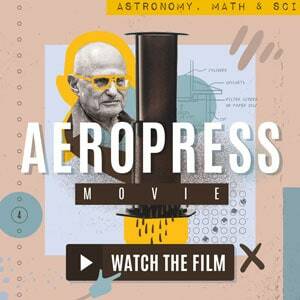 “Then I went to a barista course which turned my world upside down. 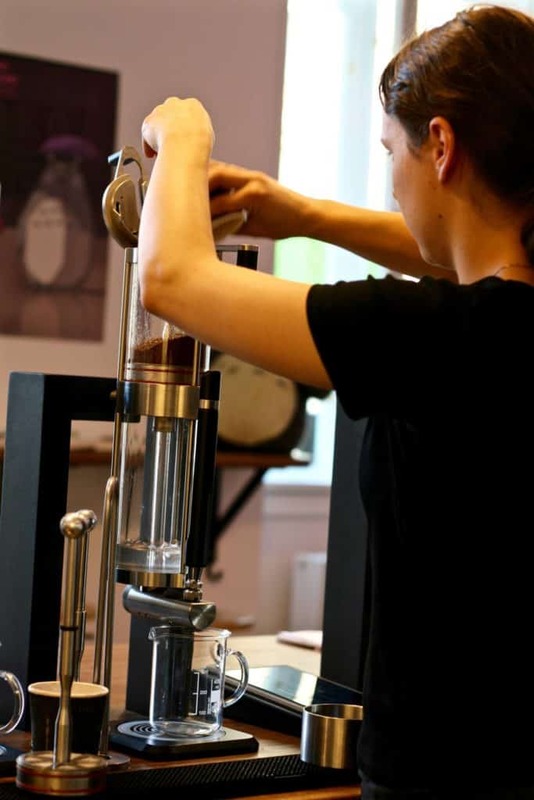 I discovered the world of speciality coffee and suddenly realized that people would like to have something nice to drink while looking at my pictures,” adds Jackie how the idea evolved. “Then, it quickly became more of a café, rather than a simple gallery and at that point, I thought I can also serve some food…” he adds, smiling. From that moment on, a combination of luck and hard work had laid the foundations of the future fame. In around six months after opening, the place has already become the number one for local hipsters and foodies. But let’s go back in time once more with a bit of a family history. Jackie is not the first Tran working in gastronomy. 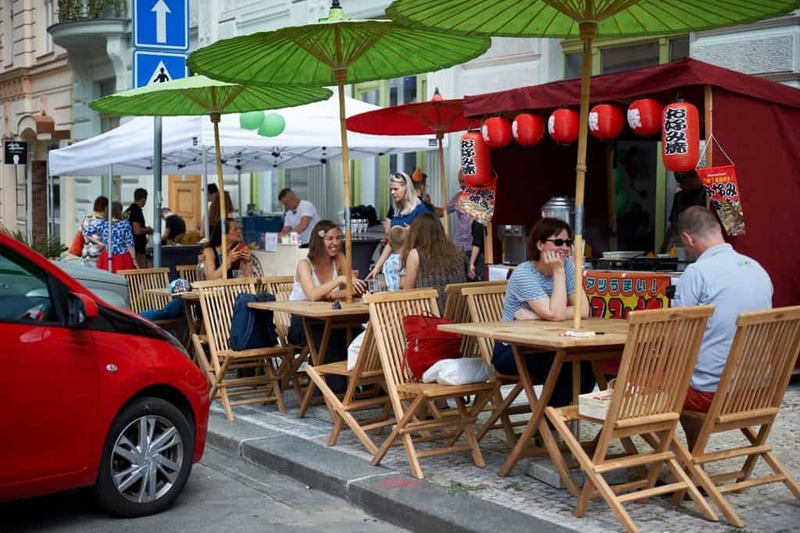 His family owns Prague’s most famous Vietnamese bistros focused on authentic Vietnamese cuisine. Thanks to a lot of chance and luck the first of them, Pho Vietnam, is located just a few steps from Cafefin. 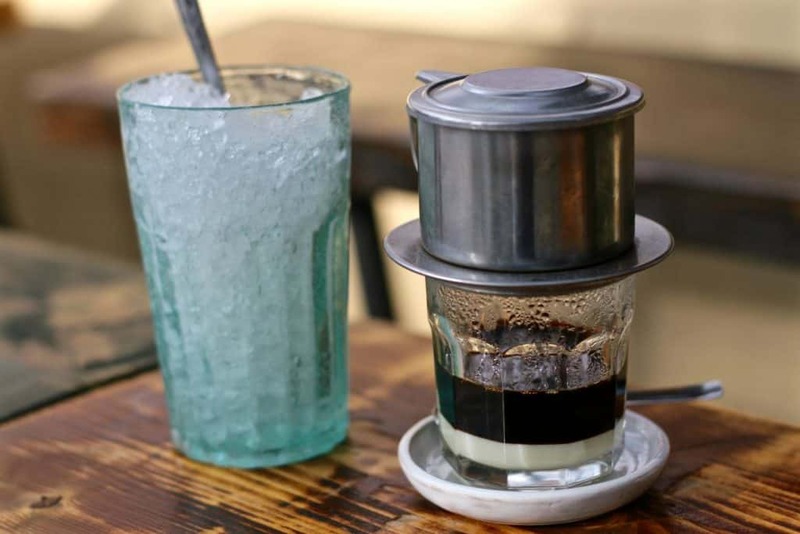 If you're wondering what the suffix “fin” means, it is a method of Vietnamese filter coffee, thus it nicely represents all the important aspects of this place, too. 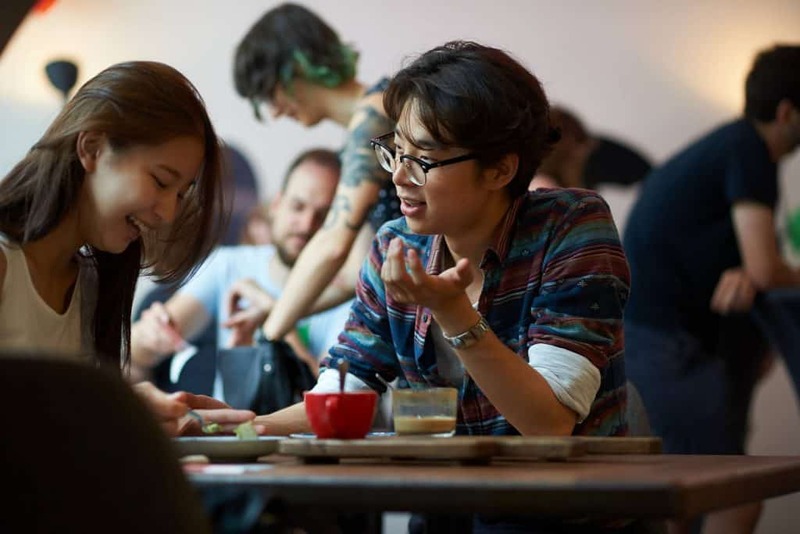 A combination of Vietnamese and Czech cultures, food and drinks. But let's get back to coffee. 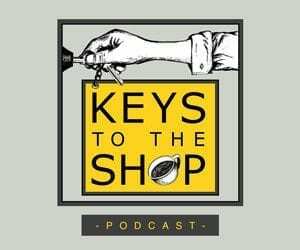 Espresso based drinks, as well as filter coffees, are often prepared with beans from different roasters such as Nord Beans, Five Elephant or Koppi. Koppi’s Costa Rican brewed with a V60 was very chocolaty, with a fruity aftertaste. We also tried an El Salvadorian from Five Elephant as a double espresso. A very fruity and bright with a lot of acidity in the aftertaste. You should definitely try the Vietnamese fin, which is made with coffee from Trung Nguyen coffee roasters, in an atypical ratio of 80% Robusta and 20% Arabica. It is served in something very similar to Kalita. 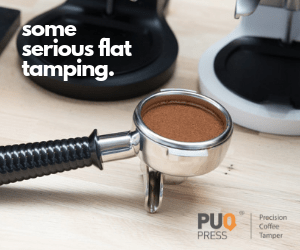 Another big difference from other filter coffees is the sweet condensed milk on the bottom of the cup, into which the coffee brews. After stirring it thoroughly you may pour it over ice cubes, which soften the strong taste. 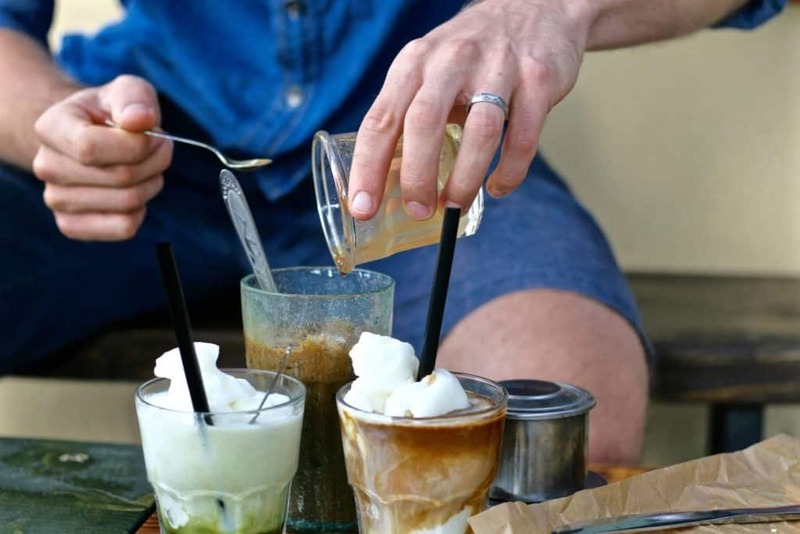 “There has always been a lack of fresh milk in Vietnam, that is why they started to use the condensed milk to soften the coffee which was quite strong,” explains Jackie. “I like to play with different tastes and invent new combinations to traditional recipes, thus we serve not only the classic fin but also a mixture of fin coffee and crushed iced coconut.” It is called ‘Coconut on ice’ and it adds more sweetness to the coffee as well as a gentle tropical touch. Let’s have a look on the menu though. I would not be too far from the truth if I said it was the avocado toast that made the place famous. Even though I am joking it does say quite a lot about the offer as a whole. “The difference between me and my parents is that they make traditional and authentic cuisine. I wanted to create a fusion,” explains Jack the basis of the menu. “It combines Vietnamese ingredients and recipes with the ones Czech people know and want, for example, avocado. It is an ingredient we barely use in Vietnam, but it is a favourite and requested here, in Prague. When I combined it with Vietnamese seasonings and herbs it gave me something rather unusual and tasty.” Well, I cannot but agree. The first time you visit, try their sweet rice called cháo. Served either with mango or tropical fruits and nuts, its freshness and light sweetness will amaze you. It is also quite filling, making it a great breakfast meal. I also tried homemade yoghurt with black rice and coconut and as though the combination may sound a bit weird, it was something very delicious and unusual in the very best of sense. Don’t you love the possibilities this world offers as much as we do? We are lucky to enjoy Japanese and Vietnamese specialities in the heart of Prague while drinking an excellent cup of coffee. To try something you may have never tried before, come to Cafefin or Momoichi. I highly recommend it.